Click here to purchase a “period pack” and learn more about it below. Originated by the Junior League of London, the Little Black Dress Initiative (LBDI) is a global initiative that seeks to make “poverty unfashionable” by raising awareness of the impact of generational poverty. Advocates wear one black dress (or outfit) for five consecutive days to illustrate the effects that poverty can have on a woman’s access to resources, her self-esteem and professional opportunities. Each advocate wears a pin on their outfit that reads, “Ask Me About My Dress,” to encourage dialogue among colleagues, friends and strangers about this important initiative. Growing up in poverty is one of the greatest threats to healthy child development, and poverty and financial stress can impede a child’s cognitive development and their ability to learn. So, the LBDI was a natural fit for the Junior League of Gwinnett and North Fulton Counties (JLGNF). 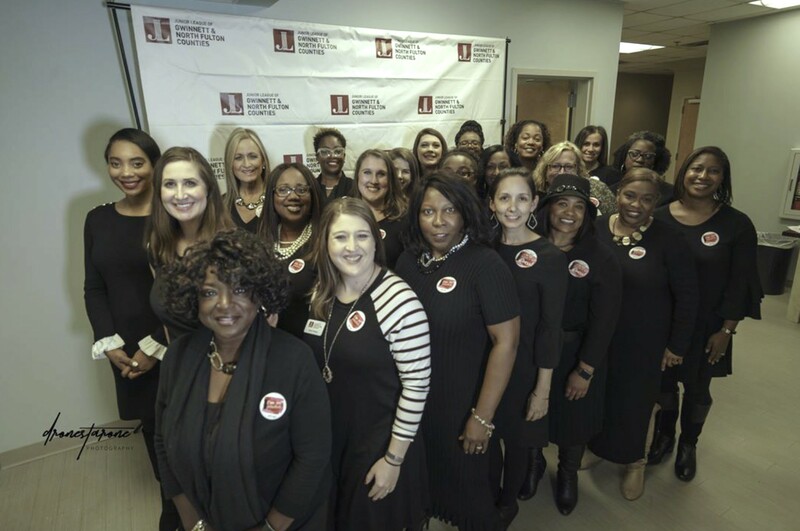 JLGNF members wearing their black ensembles for the LBDI in 2018. Our focus for the 2018-2019 League year is “period poverty.” JLGNF is encouraging members and supporters to purchase “period packs” to help women in our community gain access to this necessity. Why did we choose this uncomfortable topic? Nearly all women have at least one period in their lifetime. Because many of us are fortunate to have the resources available to care for ourselves during menstruation, we oftentimes forget to consider the impact of not having the ability to access affordable feminine hygiene products. Junior Leagues of Georgia State Public Affairs Committee (GA SPAC) and JLGNF are supporting legislation under House Bill 731, which would exempt feminine hygiene products from sales tax. 1.5 million Georgians are living at the poverty level, meaning a family four living on or below an annual income of $24,860. 15.5% of working-aged women in Georgia are living in poverty. The gender wage gap in Georgia is ranked at #15 in the country, with women earning 82.7 cents for every dollar earned by men. How does this impact women each month? Average yearly cost of menstrual products: $70 to $110 a year before sales tax. For a household that runs on $24,860, that kind of expense that can easily mean the difference between paying a bill or defaulting on a loan. Join the conversation to help spread awareness and follow along on social media using #JLGNFdoesLBDI, #JLGNFHelpsWomenPERIOD and #theLBDI. Click here to make a donation and learn about the JLGNF Annual Fund.